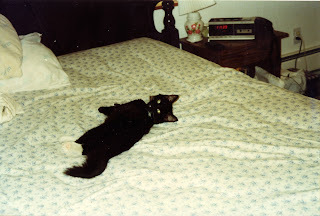 Last weekend was also the one-year anniversary of the death of our cat Figaro. As some of you know, he developed cancer about a month before we moved here to New Zealand. The cancer moved quickly (I personally think he'd had it for a while, but it was undetectable) and we had to have him put to sleep only a week after the diagnosis. It helped to move across the world, and not be in a house where I could see Figgy everywhere. I've dreamt about him a lot too, which has been really nice, and there are still mornings where I swear I can hear him purring like he used to do to wake me up. Figgy as a kitten, shortly after he first appeared in my life (as a stray). He was so cute - how could I not take him in? His favorite perch in my first Pittsburgh apartment. On the road with me. A hot summer in Arizona + too many knots in his fur = the "lion cut". Oh how sad, I am sorry. We always had cats, and we always seemed to have 3. As one would pass another would arrive on the doorstep. I feel your pain as we had to have two of ours cats 'put down' together. Pudsey has feline AIDS, and Teasle lost the use of his legs. Sad times but they give you so much joy and happy memories. Your pictures are brilliant, I love the one of the 'lion cut', I didnt even know that was a real thing!! Oh, the Figster was such a cutie. I always liked his laid back attitude. R.I.P., little Figgy. There are endless toy mice in cat heaven. I certainly relate to what you were saying. It's great that you're having dreams of him. He's still with you.